Whitney – What’s In A Name? 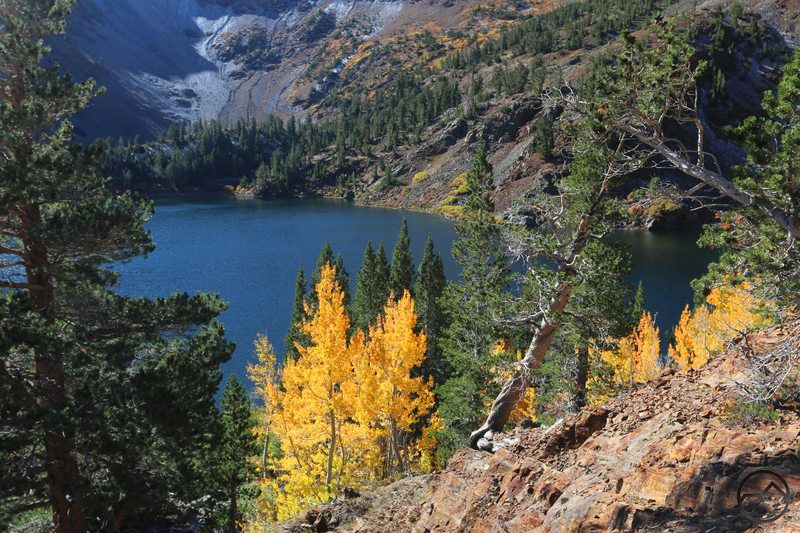 Bright fall color at Parker Lake is overshadowed by the massive cliffs of Parker Peak. Autumn can be a magical time of year. With the lowering of the sun’s position in the sky and changing palette of the forests, it often seems to glow. When thinking of fall color, New England is often the the go-to destination, with Colorado and its great aspen forests are often the most recognized locations. Other areas, like the larches of the North Cascades or the vast brushy panoply of aspens, serviceberries, hawthorne, maple and oaks that make up the kaleidoscope of the Wasatch Mountains offer unique and spectacular scenes that may not be as well known to the general public. California, however, is generally not as well known for the turning of the leaves. Great scenes may unfold in places where there are lots of vineyards but for the most part, autumn brings a sprinkling of beautiful color but not overwhelming scenes. 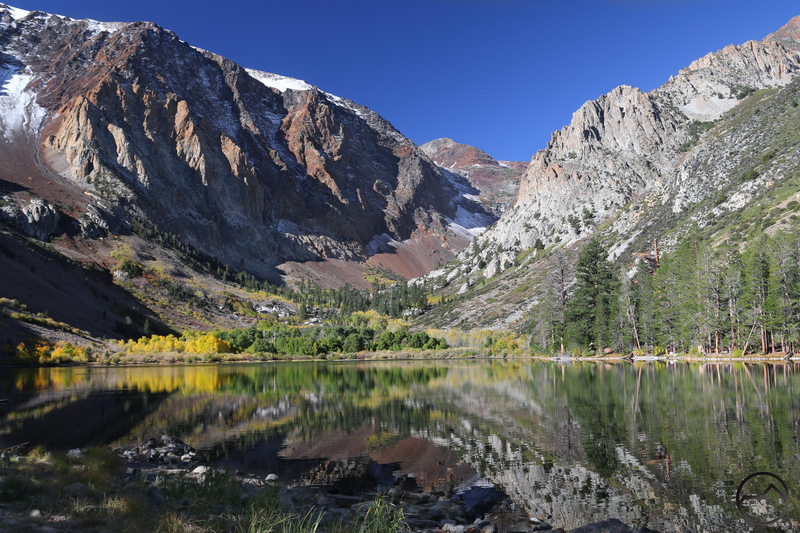 However, for those who hunger for fall color in the Golden State, the one place to go for a chance to catch spectacular scenes punctuated by gold and orange and red is the Eastern Sierra Nevada. The remote side of California’s grandest mountain range, influenced by the presence of the Great Basin Desert, is loaded with aspens, cottonwoods and willows and offers a chance to see magnificent autumn scenery amidst even grander mountains. It is a sight not to be missed! While there are pockets of beautiful color throughout the Sierra Nevada, the area that yields the best scenery and the best conditions lies south of the Walker River Canyon, along the route of Highway 395. North of this area there are still good spots that deserve to be sought out, especially Hope Valley near the Mokelumne Wilderness. Nonetheless, the best aspen groves and the most fantastic scenery all lies south of the Walker River, along the great eastern escarpment of the Sierra. 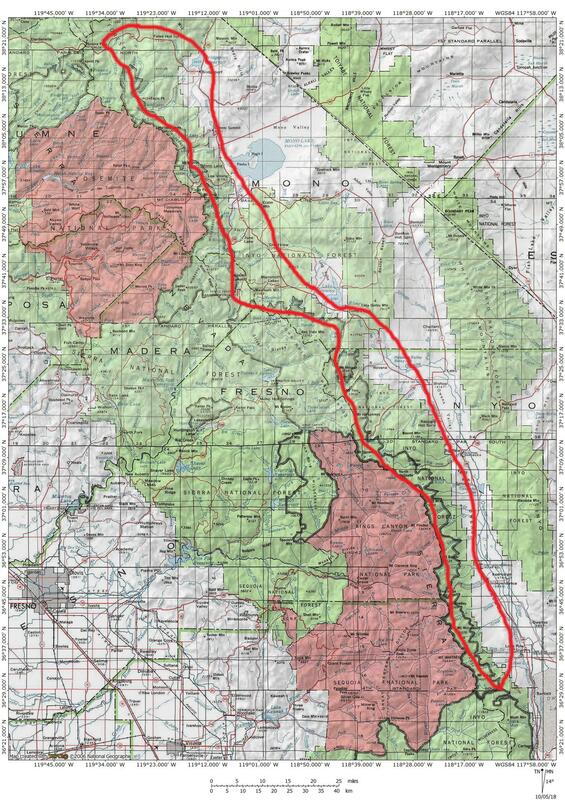 The area circled in red is where there is a good chance of seeing excellent fall color. Fall color, surrounded by desert, thrives along Laurel Creek. The conditions in the Eastern Sierra are just right for groves of aspens and cottonwoods – two of the best trees for fall colors – to grow. The tall Sierra Nevada wring moisture coming inland from the Pacific Ocean, layering the range with deep snow in the winter. The vast region to the east is the Great Basin Desert, one of the four great desert systems of the United States. There is little moisture left in storm systems to provide much water for this extensive area. Consequently, the arid landscape dominates everywhere except where mountains reach high enough to ciphon water out of recharging storms. In these areas aspens and conifers thrive. These high elevation oasis also produce small rivers and creeks that flow into the desert below. Along these slender watery corridors thrive cottonwood trees. These deciduous trees were referred to as the “tree of life” by pioneers due to their proclivity to grow in parched environments. Their presence meant that water for thirsty travelers had been found. Thus, the Eastern Sierra is a combination of the alpine environment of the high elevation and the desert environment of the vast Great Basin. The alpine environment produces large, lively creeks and rivers flowing into the desert landscape, around which aspens and cottonwoods thrive. Consequently, this area has the promise of great fall color. Fall color at Upper Chocolate Lake. It should be noted that, while the meeting of the alpine and desert landscapes is where most of the fall color will be found, there are many locations at the higher, alpine elevations where there is a surprising amount of color splashed amongst the magnificent spires of the High Sierra. In these places the color generally comes from willow. These are not the tall, stately weeping willow trees but smaller, bush-like willows that are found along lakes and creeks near treeline. This is not a landscape one may expect to find vivid color from turning leaves but it occurs nonetheless. It should be noted, however, that the color at this elevation usually comes much sooner than it does lower down. As a rule of thumb, the summer ends earlier the higher the elevation. 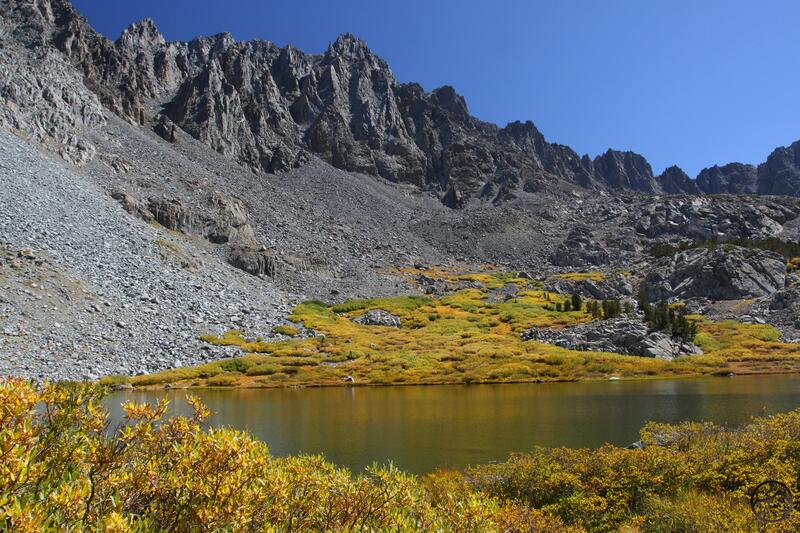 While the color in the Eastern Sierra may generally come in smaller pockets than one would expect to find in more well-known autumn destinations, few places can compete with the grandeur of the scenery. The eastern escarpment of the Sierra Nevada is possibly the grandest mountain vista in all of America. The massive fault block mountains boast enormous canyons, towering rock spires, great cliffs, crystalline lakes and rushing creeks. It is an ideal mountain landscape. It is spectacular in any season but the fall color that covers the land and punctuates the cliffs only enhances the scenery, crowning the mountains like a bejeweled crown before winter’s snowy blanket descends. Fall is also a great time to visit the region. While there is a chance that the weather can turn cold or a storm can move in, there is even greater odds that the conditions will be absolutely idyllic. The days are often perfectly warm and not hot with cool to cold nights, perfect for getting out and hiking the seemingly unlimited number of trails that course through these amazing mountains. The pace is also significantly slower than during the summer months (and at Mammoth, during the winter as well!). This makes visiting during the fall color season even more enjoyable. 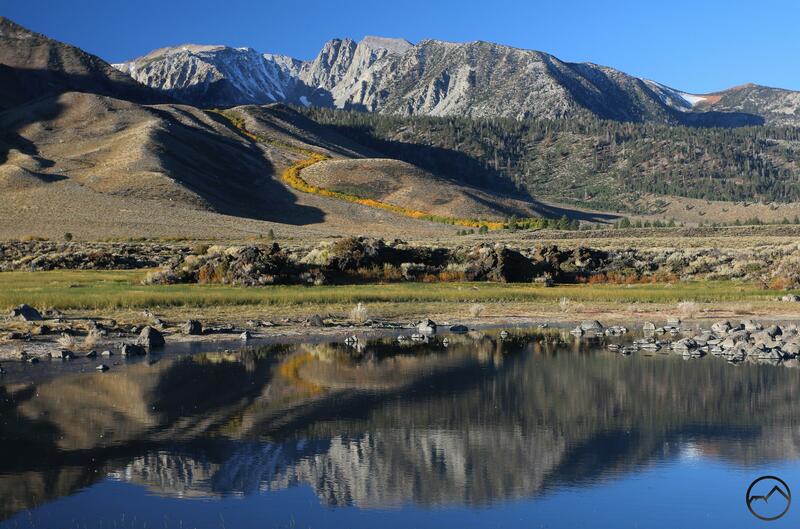 All in all, the Eastern Sierra Nevada is one of the most spectacular destinations in the world. When autumn comes, the color only enhances the beauty even further. It is the perfect time to explore. We recently hiked Bishop Creek (Chocolate Lakes Loop), Lundy Canyon, and Leavitt Meadows. Lundy Canyon had the greatest density of brilliant Fall color, while the lakes around Chocolate Peak were stunning. Leavitt was also a good hike but a bit short on color once we left the Walker River. That’s all grand stuff. You really can’t go wrong down there. The hike up around the Cloudripper is one of my all-time favorites, though Lundy Canyon is tough to beat. It is too bad that the trail at the head of the canyon got wiped out. Hikers used to be able to access the 20 Lakes Basin that way – it was one of the greatest hikes in the Sierra. Lundy definitely has great fall color too…now if those beavers would rebuild the dam! 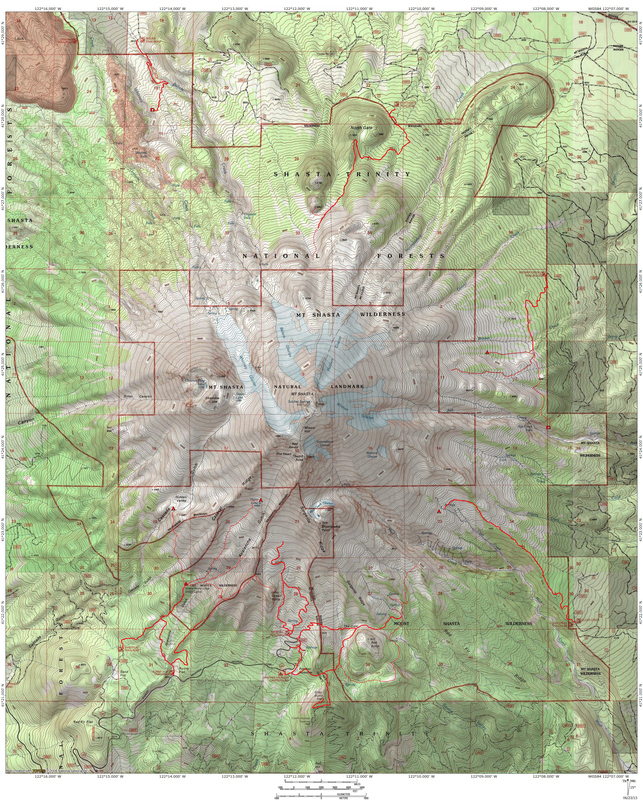 Enter your email address to follow Hike Mt Shasta and receive notifications of new posts by email. DISCLAIMER: Any use of the information contained in this site by any and all persons is done at their own risk. The operator of this site shall be held harmless from any and all alleged claims, demands, causes of action, liability, loss, damage and/or injury to property or persons whether brought by an individual or other entity. This indemnification applies, without limitation, to all actions by an individual or other entity as a result of their use of information contained in this site.